I am Humbled to be included as a small part of the Joust Wiki. Arcade flyer for Joust. Pictured is a player in front of the arcade cabinet. Joust is an arcade game developed by Williams Electronics and released in 1982. It is a platform game that featurestwo-dimensional (2D) graphics. The player uses a button and joystick to control a knight riding a flying ostrich. The object is to progress through levels by defeating groups of enemy knights riding buzzards. John Newcomer led the development team, which included Bill Pfutzenrueter, Jan Hendricks, Python Anghelo, Tim Murphy, and John Kotlarik. Newcomer aimed to create a flying game with co-operative two-player gameplay, but wanted to avoid a space theme, which was popular at the time. Staff worked within the technical limitations of the hardware (originally developed two years earlier for Williams’ first game, Defender), excluding concepts and optimizing the visuals. The player navigates the yellow knight (top center) around the game world to defeat the enemy knights. Scores are kept track in the center portion of the bottom platform. Joust is a platforming game where the player controls a yellow knight riding a flying ostrich from a third-person perspective. Using the two-way directional joystick and the button for flapping the ostrich’s wings, the player flies the knight amidst the floating rock platforms and above pools of lava; when maneuvering off the screen to either side, the player will continue its path reappearing from the opposite side. Home console versions use game controllers with directional pads and analog sticks. The rate at which the player repeatedly presses the button causes the ostrich to fly upward, hover, or slowly descend. The objective is to defeat groups of enemy knights riding buzzards that populate each level, referred to as a “wave”. Upon completing a wave, a subsequent more-challenging wave will begin. Players navigate the knight to collide with enemies. The elevation of an enemy in relation to the player’s knight determines the outcome of the collision. If the protagonist is higher than the enemy, the villain is defeated and vice versa. A collision of equal elevations results in the two knights bouncing off each other. A defeated enemy will turn into an egg that falls toward the bottom of the screen, which a player can collect for points. An egg that sits on a platform long enough will hatch into a new knight; if the player does not pick him up, he will gain a new mount and must be defeated again. The game features three types of enemy knights—Bounder, Hunter, and Shadow Lord—that are worth different amounts of points. A pterodactyl will appear after a predetermined time frame to hunt the hero. A second player, controlling a blue knight on a stork, can join the game. The two players can either cooperatively complete the waves or attack each other while competitively defeating enemies. Joust was developed by Williams Electronics, with John Newcomer as the lead designer. Programmer Bill Pfutzenrueter and artists Jan Hendricks and Python Angheloassisted him. Tim Murphy and John Kotlarik handled the audio design. The game features amplified monaural sound and raster graphics on a 19 inch color CRT monitor. Like other Williams arcade games, Joust was programmed in assembly language. A pack of three AA batteries provide power to save the game’s settings and high scores when the machine is unplugged from an electrical outlet. The cabinet artwork, by Anghelo, is stenciled on a wooden frame. Anghelo also designed artwork for promotional materials; one such flyer featured archaic English, which was also incorporated into the game’s on-screen instructions. Following the success of the 1980 title Defender, Williams searched for new creative staff. Believing video games to be the future of entertainment, Newcomer left his job as a toy designer to work at the company who hired him to create game ideas as support for development staff. After a few days, he generated a list of ideas that included game ideas for The War of the Worlds and Joust, Newcomer’s top two choices. Technical specifications dictated the selection; Newcomer’s vision of The War of the Worlds was infeasible, but Joust could be accomplished with Williams’ available hardware. A development team was formed, which decided to create the game using Defender‘s hardware. Newcomer conceived Joust as a “flying game” with co-operative two-player gameplay. Rather than emulate the popular space theme of previous successful flying games like Asteroids and Defender, he wanted to offer an alternative to spaceships. To that end, Newcomer made a list of things that could fly: machines, animals, and fictional characters. After evaluating the positive and negative of each idea, he chose birds, believing that they would have a wide appeal. Newcomer also felt that birds were a good fit as he was familiar with fantasy and science fiction media featuring birds. To further increase his understanding, Newcomer went to the library to study mythology. He felt that the primary protagonist should ride a majestic bird. The first choice was an eagle, but the lack of graceful land mobility dissuaded the designer. Instead, Newcomer chose an ostrich because he thought a flying ostrich was more believable than a running eagle. To differentiate between the first and second player characters, the developers picked a stork, believing the proportions were similar to an ostrich while the color difference would avoid confusion among players. Newcomer chose vultures as the main enemies, believing that they would be recognizably evil. Anghelo created concept of the characters as guidance for further design. The decision to use birds prompted Newcomer to deviate from the then standard eight-direction joystick. He implemented a “flapping” mechanism to allow players to control the character’s ascent and descent. With the vertical direction controlled via the arcade cabinet’s button, a two-way joystick was added to dictate horizontal direction. Though other Williams employees were concerned over the design, Newcomer believed that a direct control scheme for flight would strengthen the connection between the player and the character. The combat is devised to allow for higher levels of strategy than traditional shooting games. Because flying became an integral gameplay element, he chose to have characters collide as a means of combat. Newcomer felt that the characters’ heights on the screen were the best way to determine a victor. The developers created the game using 96K of memory, which limited the file size of individual graphics and sound effects they could use. The memory limits also prohibited Newcomer from creating more characters. The graphics were created at the pixel level and hand-animated. To animate the birds, Hendricks used Eadweard Muybridge‘s bookAnimals In Motion as a reference. Given the limited memory, she had to balance the number of frames to minimize file size, while maintaining realistic animation. Hendricks originally picked grey for the buzzards, but chose green instead to optimize the color palette as the developers had only 16 colors to create the visuals. Once the colors were decided for the character sprites, Newcomer finalized the look of the platforms. The hardware had limited audio capabilities, and sounds typically required larger amounts of memory than graphics. Working with these restrictions, Newcomer instructed Murphy and Kotlarik to focus on select sounds he deemed important to reinforcing gameplay. He reasoned that the audio would serve as conspicuous hints that players could use to adjust their strategy. Though Newcomer prioritized the wing flap, other sounds effects like those related to the pterodactyl, collisions, and hatching eggs were considered important as well. In designing the levels, Newcomer added platforms to the environment after the combat was devised. A static game world was chosen over a scrolling world to showcase visual textures applied to the platforms. The hardware could not easily display the textures while scrolling, and the team felt that displaying the whole environment would aid players. The last game world element was a lava pit and a hand reaching out of it to destroy characters too close to the bottom. Newcomer placed the platforms to optimize Pfutzenrueter’s enemy artificial intelligence (AI), which factors attack patterns based partly on platform placements. The knight enemies were designed to exhibit progressively more aggressive behavior. Bounders fly around the environment randomly, occasionally reacting to the protagonist. Hunters seek the player’s character in an effort to collide. Shadow Lords fly quickly and closer to the top of the screen. Pfutzenrueter designed them to fly higher when close to the protagonist to increase the Shadow Lord’s chances of victory against the player. The pterodactyl was designed to attack idle players and be difficult to defeat. The only vulnerability was attacking the creature in its open mouth during a specific animation frame. Newcomer and Pfutzenrueter designed the pterodactyl to quickly fly upward at the last moment when approaching a player waiting at the edge of platform. This was done to prevent an easy defeat of the enemy. When processing the graphics, the game gives priority to the player characters over the enemies. As a result, enemies begin to react more slowly when the number of on-screen sprites increases. While playtesting the game, the team discovered an animation bug they described as a “belly flop”. The flaw allows players to force the ostrich or stork sprite through an otherwise impassable small gap between two adjacent platforms of very close elevation. Because it provided an interesting method to perform a sneak attack on an opponent below the gap, the developers decided to keep the defect rather than fix it. Newcomer also attributed the inclusion to excessive playtesting that limited the time available to find a solution. A second bug, which allows the pterodactyl to be easily defeated, was discovered after the game was first distributed. Newcomer designed the game and its AI with each sprite’s dimension in mind. A day before the game was finished, however, the pterodactyl’s sprite was altered to improve the appearance. The new sprite allowed the pterodactyl to be easily defeated an unending number of times. 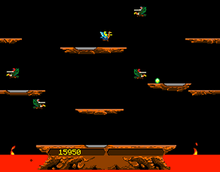 The player could sit on the center ledge, with a single enemy knight caught indefinitely in the hand of the “lava troll,” and kill an unlimited number of pterodactyls simply by turning to face them as they entered the screen in a rapid, never-ending sequence. Using this flaw, the player could quickly accumulate a very high score and a large cache of lives, with no significant skill required. Upon learning of the flaw, Williams shipped a new ROM for the arcade cabinets to assuage distributors’ complaints. Given the different control scheme, Williams was concerned that the game would be unsuccessful. 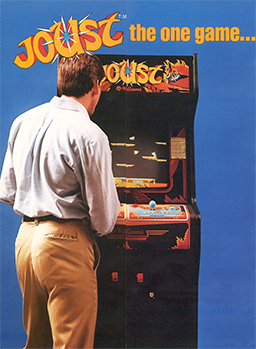 Though arcades were hesitant to purchase the game for the same reason, Joust sold well. Williams eventually shipped 26,000 units. A cocktail table version was later released, engineered by Leo Ludzia. It differs from other cocktail games in that it features side-by-side seating rather than opposing sides. This setup allowed Williams to use the same ROM chip as in the upright cabinets. The cabinets have since become collector’s items. Though the upright cabinets are common, the cocktail version is a rare, sought after game.Between 250-500 units were manufactured. Players have competed to obtain the highest score at the game. Expert players exploited software bugs to extend the length of their play time and obtain higher scores. One bug, which facilitates the defeat of the pterodactyl, allows players earn a large number of “extra lives”. Players can then use the excess lives to leave the game unattended while they rest. Joust was also referenced in the video games Mortal Kombat 3 as Shang Tsung`s Friendship and World of Warcraft: Cataclysm. The World of Warcraft version includes a playable mini-game in which a player must equip a lance and dismount enemies, as well as break eggs, and features the same flying mechanics seen in the original game. The Knight and Ostrich appear in Wreck-It Ralph. It is seen flying in Game Central Station. Joust was played by the protagonist in Ernest Cline‘s book Ready Player One inside the virtual world of OASIS in order to win a copper key. Author Steve Kent considered Joust one of the more memorable games of its time. Author David Ellis agreed, and stated that the game retains it enjoyment in contemporary times. In 2008, Guinness World Records listed it as the number sixty-nine arcade game in technical, creative, and cultural impact. A writer for Video Gaming Illustrated called Joust exotic and praised the animation as lifelike. Kevin Bowen of GameSpy‘s Classic Gaming wrote that despite a concept he described as “incredibly stupid”, Joust is an appealing game with good controls and competitive gameplay. Bowen further commented that the multiplayer aspect differentiated the game from others at the time. He described it as “one of the first really fun multiplayer games” and a precursor to the video game deathmatch. Retro Gamerwriter Mike Bevan praised the game’s physics, calling them “beautifully realised”, and described Joust as one of Williams’ “most remarkable and well-loved titles”. AComputer and Video Games writer called the game “weird and wonderful”. Author John Sellers praised the competitive two-player gameplay, and attributed the game’s appeal to the flapping mechanism. In 2004, Ellis described Joust as an example of innovative risk absent in the then-current video game industry. In retrospect, Newcomer commended Williams’ management for taking a risk on him and the game. The game has garnered praise from industry professionals as well. Jeff Peters of GearWorks Games lauded the gameplay, describing it as unique and intuitive. Fusion Learning Systems’ Jeff Johannigman praised the flapping mechanism and Kim Pallister of Microsoft enjoyed the multi-player aspect. A pinball version was released in 1983, designed by Barry Oursler and Constantino Mitchell. The game includes artwork and themes from the arcade version. In addition to single player gameplay, it features competitive two-player gameplay with the players on opposing sides of the machine. Less than 500 machines were produced. Joust was ported to the Nintendo Entertainment System version, and to several Atari platforms: the Atari 2600, Atari 5200, Atari 7800, and Atari Lynx consoles, as well as Atari 8-bit and Atari ST home computers. Macintosh and personal computer versions were also released. Tiger Electronics released a small keychain versionof Joust in 1998. A mobile phone version was released in 2005, but omitted the flapping control scheme. In 2000, a web-based version of Joust, along with nine other classic arcade games, was published on Shockwave.com. Four years later, Midway Games[Note 1] also launched a website featuring the Shockwave versions. The game was included in several multi-platform compilations: the 1996 Williams Arcade’s Greatest Hits, the 2000 Midway’s Greatest Arcade Hits, and the 2003 Midway Arcade Treasures. Other compilation titles are the 1995 Arcade Classic 4 for the Game Boy and the 2005 Midway Arcade Treasures: Extended Play for the PlayStation Portable. Joust was released via digital distribution on GameTap, Xbox Live Arcade, and the PlayStation Network. In 2012, Joust was included in the compilation Midway Arcade Origins. Other remakes were in development, but never released. Previously unreleased Atarisoft prototypes of Joust for the ColecoVision surfaced in 2001 at the Classic Gaming Expo in Las Vegas. An adaptation with three-dimensional (3D) graphics was in development for the Atari Jaguar CD. Titled Dactyl Joust, it was eventually canceled. Newcomer pitched an updated version of the arcade game for the Game Boy Advance to Midway Games. The company, however, did not sanction it. The prototype featured multi-directional scrolling, more detailed graphics based on 3D renders, and new gameplay mechanics. Midway Games optioned Joust‘s movie rights to CP Productions in 2007. Michael Cerenzie and Christine Peters of CP Productions planned to expand on a game element for the film’s premise. Cerenzie described the script by Marc Gottlieb as “Gladiator meets Mad Max“, set 25 years in the future, and Peters commented that the action oriented film would appeal to a general audience. The movie was planned as a tent-pole movie, with a graphic novel by Steven-Elliot Altman as part of the media franchise’s release. Midway Games also considered a video game adaptation of the film. Joust‘s expected release date was set in June 2008 and then later pushed back to 2009. The video game company, however, filed for Chapter 11 bankruptcy in 2009. Warner Bros. Interactive Entertainment purchased most of Midway’s assets, including Joust, with the intent to develop movie adaptations. Several titles by other developers feature gameplay that either copies or builds upon Joust‘s design. The 1983 Jetpac and Mario Bros. feature elements inspired by it, as well as the 1984 Balloon Fight. Between 2011 and 2013, McDonald also played as many Joust machines as he could locate across the U.S., playing to 10 million points each game, in order to reach 1 billion total points. In the spring of 2013 he completed this tour with his 100th game at the old Williams headquarters at 3401 N. California Ave. in Chicago. People in attendance included Roger Sharpe, Walter Day, and John Newcomer. A small reunion the night before gathered 3 members of the original development team: Newcomer, Python Anghelo, and Bill “Pfutz” Pfutzenreuter. Joust was released on July 16, 1982. In honor of the 30th birthday, on July 14, 2012, Star Worlds Arcade sponsored Lon McDonald playing a game of Joust to 10 million points at the original Twin Galaxies arcade location in Ottumwa, Iowa. The location was converted to The Optical Shoppe many years ago and had not seen a video game event since the mid-1980s. A Joust strategy guide was started as a result of this visit. Jump up^ Williams Electronics purchased Midway in 1988, and later transferred its games to the Midway Games subsidiary. Jump up^ Heineman, Bill (July 1983). “Coin-Op Classroom: Some Knights to Remember”.Electronic Games (Reese Communications) 1 (17): 114–115. ^ Jump up to:a b c d Sellers, John (August 2001). Arcade Fever: The Fan’s Guide to The Golden Age of Video Games. Running Press. pp. 94–95. ISBN 0-7624-0937-1. ^ Jump up to:a b c d e f g h i j k l m n o p q r s t u Bevan, Mike. “The Making of Joust”. Retro Gamer (Imagine Publishing) (63): 36–41. Jump up^ “Joust – Videogame by Williams Electronics”. International Arcade Museum. Retrieved 2010-07-13. ^ Jump up to:a b James Hague, ed. (1997). “Eugene Jarvis”. Halcyon Days: Interviews with Classic Computer and Video Games Programmers. Dadgum Games. Retrieved 2010-07-13. ^ Jump up to:a b c d e f g Ellis, David (2004). “Arcade Classics”. Official Price Guide to Classic Video Games. Random House. pp. 337–338. ISBN 0-375-72038-3. Jump up^ Ellis, David (2004). “Classic Arcade Game Setup, Restoration, and Repair”.Official Price Guide to Classic Video Games. Random House. pp. 433–437.ISBN 0-375-72038-3. Jump up^ Vavasour, Jeff (2005-01-13). “Back To The Classics: Perfecting The Emulation For Digital Eclipse’s Atari Anthology”. Gamasutra. Retrieved 2010-10-29. Jump up^ Ellis, David (2004). “Arcade Classics”. Official Price Guide to Classic Video Games. Random House. p. 385. ISBN 0-375-72038-3. Jump up^ “Joust Marathon High Score Rankings”. Twin Galaxies. Retrieved 2010-11-16. Jump up^ “Joust Tournament High Score Rankings”. Twin Galaxies. Retrieved 2010-11-16. Jump up^ Seth Green (2007-10-07). “Celebutard Mountain“. Robot Chicken. Episode 49.Adult Swim. Jump up^ Adam de la Peña (2007-08-01). “Just One of the Gamers“. Code Monkeys. Episode 5. G4. Jump up^ UGO staff. “Top 11 Mortal Kombat Fatalities Pics”. UGO. Retrieved 2008-09-01. Jump up^ Newnham, Darren (2010-12-10). “World of Warcraft Cataclysm – Review”.Yahoo! Games. Retrieved 2010-12-13. Jump up^ Kent, Steven (2001). “The Golden Age (Part 2: 1981–1983)”. Ultimate History of Video Games. Three Rivers Press. p. 177. ISBN 0-7615-3643-4. Jump up^ Craig Glenday, ed. (2008-03-11). “Top 100 Arcade Games: Top 100–51”.Guinness World Records Gamer’s Edition 2008. Guinness World Records. Guinness. p. 231. ISBN 978-1-904994-21-3. Jump up^ Video Gaming Illustrated Staff (December 1982). “Eye On: Tilting at Videogames”. Video Gaming Illustrated (Ion International) (3): 61. ^ Jump up to:a b Bowen, Kevin. “Game of The Week: Joust”. Classic Gaming. Retrieved 2010-07-14. Jump up^ “Arcade Action”. Computer and Video Games (EMAP): 30. February 1983. Jump up^ Hong, Quang (2005-08-05). “Question of the Week Responses: Coin-Op Favorites?”. Gamasutra. Retrieved 2009-05-12. Jump up^ “Joust”. MobyGames. Retrieved 2010-07-09. Jump up^ GameSpy Staff. “Joust (keychain)”. GameSpy. Retrieved 2010-10-29. Jump up^ Leeper, Justin (2005-03-16). “Joust Review”. GameSpy. Retrieved 2010-10-29. Jump up^ Parker, Sam (2000-05-05). “Midway Coming Back At You”. GameSpot. Jump up^ Kohler, Chris (2004-09-24). “Midway Arcade Treasures Web site goes live”.GameSpot. Jump up^ Weiss, Brett Alan. “Williams Arcade’s Greatest Hits – Overview – allgame”.Allgame. Retrieved 2010-07-10. Jump up^ All Game Staff. “Midway’s Greatest Arcade Hits: Vol. 1 – Overview – allgame”.Allgame. Retrieved 2010-07-10. Jump up^ Harris, Craig (2003-08-11). “Midway Arcade Treasures”. IGN. Retrieved 2010-07-10. Jump up^ “Arcade Classic 4 Defender / Joust”. GameSpot. Retrieved 2010-07-10. Jump up^ Harris, Craig (2006-02-13). “Midway Arcade Treasures: Extended Play”. IGN. Retrieved 2010-07-10. ^ Jump up to:a b IGN Staff (2007-09-04). “Joust: The Movie”. IGN. Retrieved 2010-10-29. Jump up^ Edge Staff (2007-05-01). “Why GameTap is Going Free”. Edge. Retrieved 2010-10-29. Jump up^ Ellis, David (2004). “ColecoVision”. Official Price Guide to Classic Video Games.Random House. pp. 146–148. ISBN 0-375-72038-3. Jump up^ “Jaguar Dactyl Joust Video Released”. GameSpy. 2003-10-08. Retrieved 2010-11-01. Jump up^ Fritz, Ben; McNary, Dave (2007-09-03). “‘Joust’ Clicks with CP: Cerenzie-Peters Banner Gets First Project”. Variety. Retrieved 2008-09-01. ^ Jump up to:a b Gaudiosi, John (2007-08-27). “New Hollywood Company Bringing Joust to the Big Screen”. GameDaily. Retrieved 2010-10-29. Jump up^ Edge Staff (2008-03-08). “Feature: Reel Gaming”. Edge. Retrieved 2010-10-29. Jump up^ “Midway Files Chapter 11”. IGN. 2009-02-12. Retrieved 2010-10-29. Jump up^ VanBurkleo, Meagan (2010-05-12). “Warner To Revive DOA Midway Titles?”.GameInformer. Retrieved 2010-10-29. Jump up^ McNary, Dave (2010-03-22). “Warner Bros. to make ‘Spy Hunter’ film”.Variety. Retrieved 2010-10-29. Jump up^ Edge Staff (2008-03-23). “The Best 50 Games of The 1980s”. Edge. Retrieved 2010-10-29. Jump up^ Fox, Matt (2006). The Video Games Guide. Boxtree Ltd. pp. 261–262. ISBN 0-7522-2625-8. Jump up^ Thomas, Lucas (2007-07-20). “Balloon Fight Review”. IGN. Retrieved 2010-07-10. Jump up^ Turner, Benjamin; Nutt, Christian (July 2003). “Nintendo Famicom: 20 Years of Fun!”. GameSpy. Retrieved 2010-07-10. Jump up^ “Buzzard Bait – Tom Mix Software”.